This country house with approximately 450 m² of living space corresponds to the latest demands in design and technical equipment. A spacious living and dining area and a very nice outdoor area with the swimming pool are waiting for the new owner. Underfloor heating, air conditioning, high-tech materials. The property is sold in its current state for a total of 1.200,000 €. The completion of the contruction is estimated at around 500,000 €. 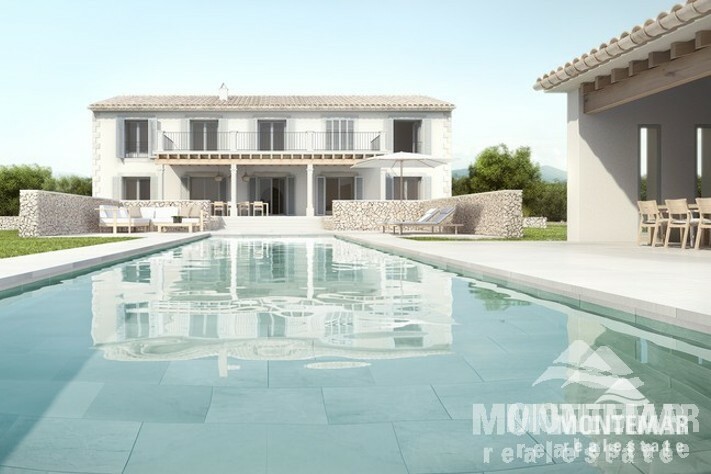 Situated just a few kilometers away from Felanitx and Campos, the finca is located on a 24,000 m2 plot surrounded by a typical majorcan stone wall. Very quiet with some mature trees and beautiful views of the famous monastery mountain San Salvador. Only 15 minutes by car to the beautiful natural harbour of Porto Colom or the golf course Vall d'Or.